If you read my post the other week on midi rings you'd already know I have a thing for them. I think they would make great little stocking fillers and presents for Christmas, and would be great to wear on the day itself and New Years Eve. I've noticed that there is a wide range of midi rings at pocket money prices on the high street at the moment. The majority of these rings come in between £3-£6, so that's not too much to splurge out. I really like natured inspired jewellery, so the earth wreath midi ring by Forever 21 is certainly on my Christmas wish list. It is actually a pack of two, which can be worn stacked together, or on two separate fingers. I also really like the Accessorize midi ring pack, which is also a pack of two, and the Urban Outfitters triple triangle midi ring. I think all of these rings would look great teamed with other simple, delicate jewellery. 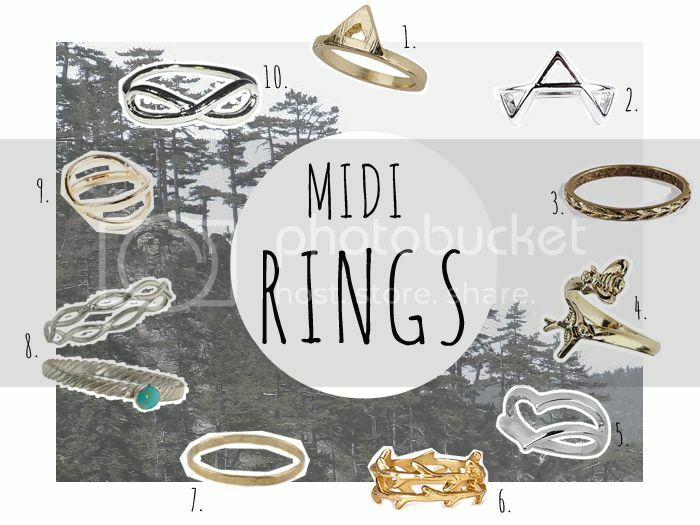 Do you like midi rings? Are any of these on your wish list for Christmas? Oh how I love midi rings! I've had so many but I always lose them, they just fall off through out the day and disappear. They're so cute though! I love midi rings and I've been looking to buy some. Thanks for this post!